My husband was out of town this week, so I did some bachelorette things, like watch back-to-back chick flicks, wear the same clothes three days in a row, sleep in the bed diagonally, and have pina coladas for dinner. That last one’s not quite as bad as it sounds, though. It was actually a green smoothie. You could add rum, but I’m being all virtuous this week (or at least saving my cheats for something better than rum). I quartered the recipe because: (1) I didn’t have that much pineapple, (2) my blender is tiny, and (3) the original recipe makes a metric fuckton of pina colada. Also, I did add a few ice cubes since my pineapple wasn’t frozen. Remember: innovation. 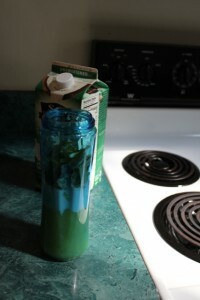 Turns out that a beer glass is the perfect size container for what a quarter of the recipe makes. It also turns out that you can’t really even taste the spinach, but you can still fool yourself into thinking you’re having a nutritious dinner, because spinach. 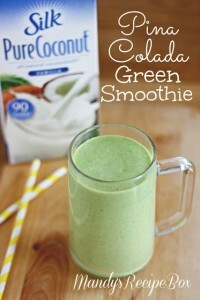 This looks pretty tasty but coconut milk and my intestines do not play well together. Some big box stores like Target carry frozen pineapple…just in case you get the urge to tweek your “version”…FYI. Carry on! Or, y’know, you could just put regular canned pineapple in the freezer. There is something magical about being able to sleep in the bed diagonally. When I’m home alone I play video games in my wedding dress. I don’t wear the veil though, that’s just too much. Your significant other was certainly right to lock it down with you. YESSSS! Nutritious and delicious. Now I have another excuse to have a pina colada. Ha! I always sleep in the middle of the bed when the hubs is traveling…..and I pretty much eat cereal, 3 meals a day, until I run out and have to cook something. Spinach is SO good for you-learn to love it! When I’m home alone I let the dog sleep on the bed and I cuddle him like a teddy bear. Also, pina colada flavored anything is gross. I’m still trying to convince myself I like coconut because it’s so good for you. Can we get a little more feedback on how it actually tastes, though? It’s cool that you can’t taste the spinach, but did you actually enjoy it, or was it meh? 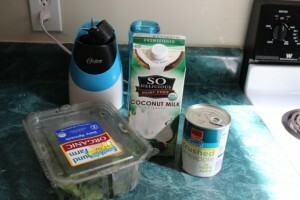 What did you “innovate” for that tropical smoothie mix stuff? Is that really necessary? I loved it when you wrote “a fuckton!” I am so going to add it to my daily vocabulary! Thank you for always making me laugh! I would like to try this but could you tell me the conversion of a metric fuckton to an imperial shitload? Thanks! LOL! I keep bags of frozen pineapple in my freezer at all times. Mainly because I love it and don’t like canned pineapple (the whole tinny thing bugs me too much). However… this looks and sounds DELISH! I drink green smoothies every morning for breakfast. Seriously, you can’t taste the spinach at all. Thanks for posting this. I tried my first green smoothie today and loved it! I used almond milk instead and it was very tasty.